Weintek MT8071iP operator panel with a screen size of 7" is designed for visualisation of technological processes running on programmable logic controllers (PLC). 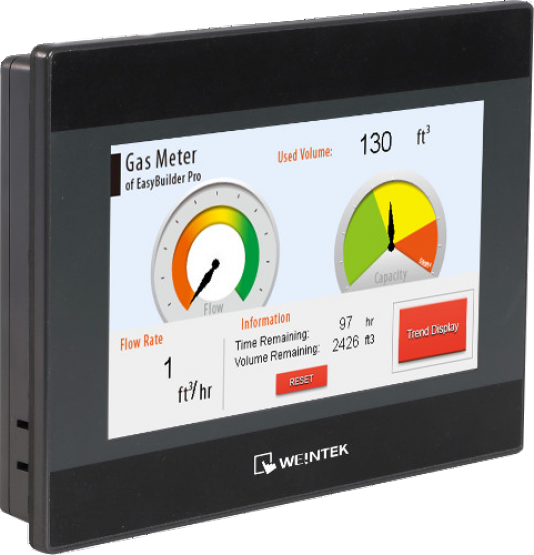 Weintek MT8071iP touchscreen HMI panel is designed for visualisation of technological processes running on programmable logic controllers (PLC). The MT8071iP model features a coloured LCD screen with 7" screen size, LCD backlight and high colour density for a high level of detail. The panel is powered by 600MHz RISC Cortex-A8 ARM CPU with 128MB RAM, giving the product enough performance for quick system boot. Device is also provided with an onboard 128MB eMMC memory. For communication, two serial ports (RS485 + RS232) are present along with a single USB 2.0 port and a single 10/100Mbit Ethernet. Configuration is performed via the Easy Builder PRO configuration software, which can be downloaded on this link for free. Product tutorial for the Mervis software, datasheets, EasyBuilder PRO software manual and a sample project can be found in the Downloads section (path Products > Weintek).